After reading and loving Liar by Justine Larbalestier, I was so excited to see that she had a new novel out. My familiarity with the author had me searching for clues along the way to the twist ending which I knew was coming. All that self-preparation still left me surprised by how it ended. Bravo! Che's little sister is terrifying. She is thrilled to kill ants, manipulate her friends into doing wrong, and using people to her advantage. Under her Shirley Temple facade lies a psychopath, but no one seems to believe Che. In his words, "Rosa is a ticking time bomb. I don't think it matters what you call it: psychopathy, sociopathy, antisocial personality disorder, evil or the devil within. What matters is how to prevent the bomb from exploding." Che seems to be the only one who can keep Rosa in check, until she starts to seem him as a nuisance, rather than an ally. While we spend the novel in the mind of Che, the title character consumes the story (and everyone around her). My stomach felt sick as I read, waiting for the next terrible thing that Rosa would do, and how she would get away with it. 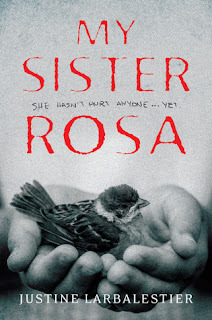 Larbalestier never pushes Rosa's terror too far; it all seems like it could be possible with a deeply disturbed child. This is what makes My Sister Rosa so scary and unsettling.